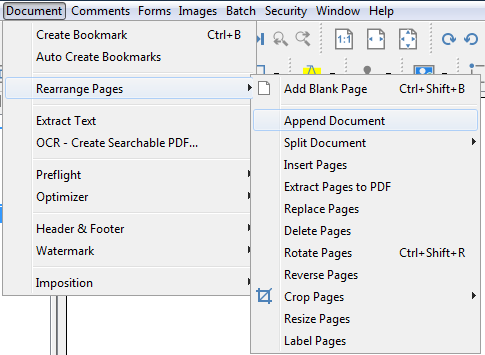 Q: How can I append documents in PDF Studio? A: PDF Studio can append any of the Supported File Types (PDF, Word, Excel, Text, Images) to a PDF. When non-PDF files are selected they will be automatically converted to PDF before being appended to the document. Files can also be appended by dragging files into the thumbnail pane directly. Select Document > Rearrange Pages > Append Document from the menu and choose the file to insert at the end of the current document. Drag a document from File Explorer into the destination document’s Thumbnail pane. A blue line will visually indicate where the document will be appended or inserted.